This year Heurista made an adventure of #GivingTuesday. We headed to the birthplace of #GivingTuesday where the efforts of the 92nd Street Y and the United Nations Foundation first created the sibling to the retail industry’s Black Friday and Cyber Monday. The annual campaign just completed its fifth year and growing in popularity across all business sectors. We explored NYC that day with a question: What are major shopping malls that promote a sense of community doing to take advantage of the opportunities that #GivingTuesday presents? The potential role of these properties has been a recent focus as we consider how a culture of generosity can be fostered where people gather for meals, entertainment, and shopping. Downtown Manhattan is booming, so we headed there. Three major mall developments anchor the neighborhood and are transforming the business-minded community into a tourist and leisure hotspot. In our sights were Westfield World Trade Center, Brookfield Place and South Street Seaport, all enormous properties with significant resources for brand messaging and community building. 1. #GivingTuesday is only beginning to find a role in retail’s seasonal marketing campaigns. Individual retailers will lead the way and malls will follow with the growth of philanthropy as a part of their brand identities. 2. All key factors to #GivingTuesday success are already built into retail holiday marketing campaigns. Policies that highlight existing charitable initiatives and opportunities for generosity on a local, national and global scale should be developed for holiday brand messaging. 3. #GivingTuesday is a rapidly developing retail marketing opportunity. We will continue to study the opportunities for philanthropic messaging as part of retail holiday marketing campaigns. Westfield World Trade Center is quite a spectacle. The Oculus, the Santiago Calatrava building the WWTC occupies, is a must-see in New York City. The interior mall feels like a booming city of its own. This is truly the cutting edge of retail development. Yet we found no mention or reference to #GivingTuesday. Moving on we entered Brookfield Place via the underground connector. ArtsBrookfield was promoting their holiday interactive light installation, Luminaries which was installed overhead. The attraction engages visitors to make a wish and affect the light installation. For each wish a donation is made to a local charity. Yet no connection was made to #GivingTuesday. The Howard Hughes Corporation, owner and manager of the Seaport District gave us what we were looking for. They planned the launch of their holiday campaign on #GivingTuesday. As part of celebration, they presented a donation to one of the neighboring community service organizations, the Lower East Side Girls Club. This act of generosity was used as a primary message from the event. 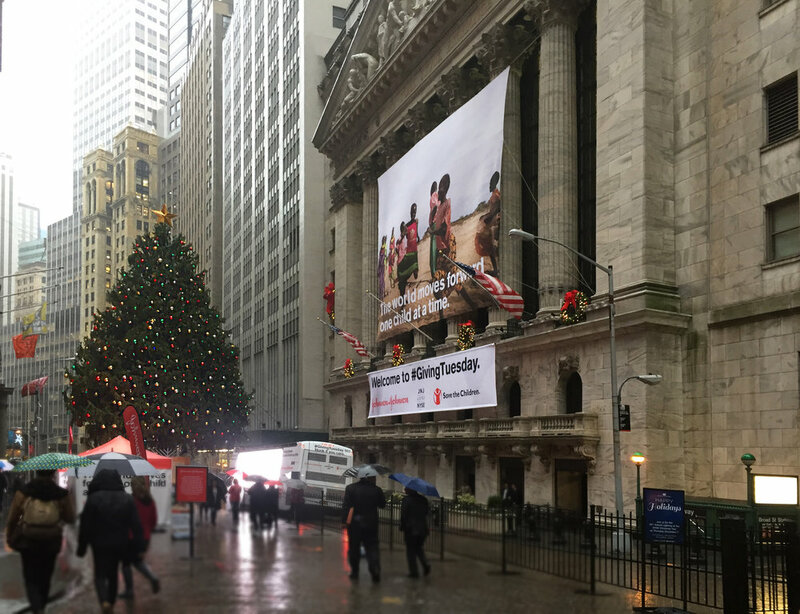 While out and about, we also stopped by the Johnson & Johnson experiential activation for #GivingTuesday on the outdoor plaza in front of the New York Stock Exchange. In spite of the heavy rain the promotion was fantastic and included a virtual reality experience and other interactive messaging experiences. Learn more about that at Anne’s post congratulating J&J on their efforts. #GivingTuesday was a brilliant kick-off to Heurista’s holiday season. Merry, Merry! #GivingTuesday engagement and philanthropic contributions increased by 20% to $168 million dollars. The average individual gift was $107.69, according to the #GivingTuesday Data Project by the 92Y. The campaign held the top trending spot on Twitter demonstrating popularity and reach.